We've made a Major Change in our Brake Pads this year, when we found out that our Previous Supplier was getting the Brake Pads made in China! 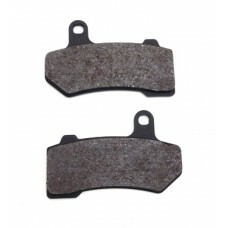 We found the Original Brake Pad Manufacture here in the USA and we are Pleased to Announce we are now Exclusively selling the KFP "Magunum" Pads! Made with American Materials by Americans these are the Finest Brake Pads for Harley-Davidsons on the Market and guess what? They are less $$$$! The "Magnum" Brake Pads are a DuPont Carbon-Kevlar (Organic) compound and is our latest advancement in high performance friction materials. This racing formula offers extreme stopping power in both wet and dry conditions. This is as close as a full race pad as you can get without it actually being a race pad. We softened the compound to make it better for street riding while still providing premium stopping power. The "Magnum" Pads are ideal for heavy touring and hard stopping. It produces no dust, no noise, and no rotor wear while providing 30% more stopping torque than the stock pads. The service life generally averages about 18,000 miles. BREMBO "MAGNUM" BRAKE PADS Made in the USA Not Like our OLD Vendor that were Made in Chi.. 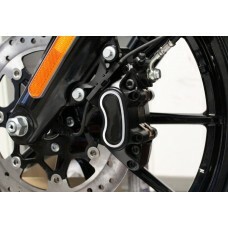 CUSTOM BRAKE INSERTS We see the Oval section on your Brake Caliper and HD sells a Chrome on..